specifications︰ YZ23B Synoptophore is a diagnostic and remedial equipment combined with optical, mechanical and electrical parts. 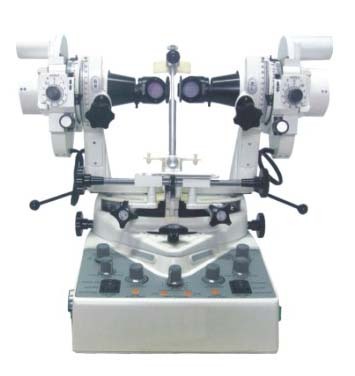 It can be used to diagnose and treat various binocular functions, such as strabismus, amblyopia, diplopia, heterophoria, etc. · Combined with functions of diagnosis, treatment, simultaneous viewing, syncretic viewing, solid viewing, and afterimage. · Equipped with a pair of Haidingers Brush, 20 pairs of pictures with different angle. · Advanced semi-transparent and semi- reflecting viewfinder is convenient for the oculists to observe. · Advanced LED luminophor with even light, low thermal and long span. · The pictures adopt new design and are anti-broken, long span. · Manual or automatical coruscation at doctor’s option and accurate frequency. · Automatical coruscation frequency: ten-step, 30—300times/minute. · Range of automatic coruscation(each cycle):1/4 on 3/4 off, 1/2on 1/2 off, 3/4 on 1/4 off. The left and right can be turned on or off at the same time. The left and right can be turned on or off alternatively. One on or off while the other can be turned on or off.